Loveland, Colo. – The Stockton Thunder picked up their first victory of the young season with a 5-4 win over the Colorado Eagles in a wild game at the Budweiser Events Center. The game saw a total of 25 penalties called and back-and-forth scoring in a frantic third period. NHL prospect Thomas Heemskerk picked up the win over rookie Mike Garman who was making his first professional start. The teams played a penalty-filled first period, with 11 total infractions called. That trend led to the Thunder taking a 2-0 lead into the first intermission as they netted both goals on the power play, scoring in both portions of a 5-on-3 advantage midway through the period. Gabriel Levesque got the first goal and Kevin Baker got the second as those two continued to do damage against the Eagles this season. The second period looked like it would pass without a goal until a late burst of scoring in the final minutes. At 18:39, Aaron Schneekloth lost an edge in the defensive zone, leading to a turnover that saw Garet Hunt quickly pass the puck to Matt Foy, who slipped it past Garman from the doorstep. But less than a minute later, Colorado finally got on the board when Jack Combs threw the puck on net from deep in the left lane and Steve Haddon — playing in his first game of the season — flipped home the rebound to counter Stockton’s score. Schneekloth atoned for his slip-up just 25 seconds into the third period by snapping a shot top-shelf from inside the right circle with the teams skating 4-on-4. But at 7:03, Foy got his second goal of the game by cleaning up a rebound in the paint after a shot from the left point. Then things really heated up. The Eagles were awarded a 5-minute power play midway through the period and Jason Beatty cut Stockton’s lead down to a single goal once more when his shot from the point squeaked past the leg of Heemskerk. Moments later, Colorado nearly tied the game when Kyle Peto’s blast bounced off the goal post (the second Eagles shot to be denied by the post in the game). It looked as if the Thunder put the game away when Jordan Foreman scored another 4-on-4 goal off an odd-man rush 18 minutes into the final frame, but that two-goal cushion was quickly cut in half again just 36 seconds later when Jon Landry buried a slap shot from between the circles. 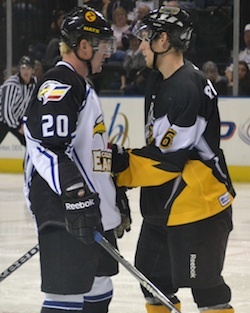 Colorado continued to put up a final push and nearly tied the game, but Stockton was able to escape with the win.